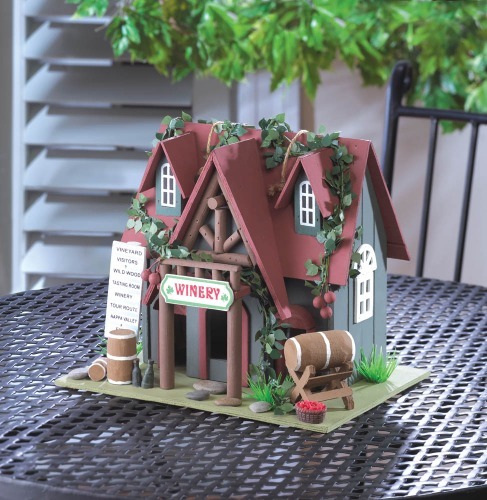 Cottage Winery Designer Birdhouse. Birds are so wonderful and beautiful that you must have a few of them to be in your garden. By having birds flying around your garden and home makes, your garden look beautiful. Even birds sing song of melody in your garden that is something everyone wants. If we want our garden or home to stand out, on way is to attract more birds to your home or garden is to have a beautiful designer birdhouse. Give the birds a home in your garden. Birds wont be able to resist an overnight stop-over at this quaint cottage winery! The green cottage features a darling brick-red roof that's crawling with ivy. Faux wine barrels perch outside, welcoming your feathered friends to the perfect place to unwind. This would make the perfect gift family and friends. Imagine this gift in a your home or resort or garden. Dimensions: 8.25" x 5" x 10.5"